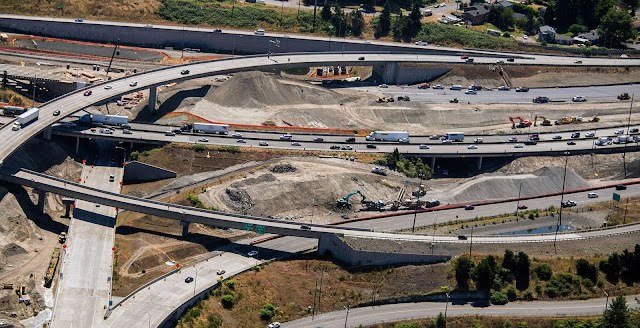 There's a lot of highway preservation work taking place this summer on Interstate 5 through Tacoma. Much of that work is building new structures and roadways, but a big part of the work is also rehabilitating existing lanes on I-5. The original 1960's concrete has served commuters well, but it is time for it to be replaced. In an effort to reduce truck trips to and from the construction site and make the most out of the materials at hand, the contractor building the I-5 – SR 16 Connectors Realignment project, Skanska, came up with a creative solution. In June, contractor crews completed pavement demolition along northbound I-5 between South 38th Street and State Route 16 to make way for new HOV lanes and newly aligned I-5 lanes. This resulted in approximately 52,569 square yards of cement concrete pavement removed from the work zone. Instead of hauling this material off of the construction site, Skanska decided to recycle the concrete on-site and reincorporate it into the project. Our rock crushing operation can be seen in the center of this photo of the I-5-SR 16 Realignment project. Crews used giant rock crushers to crush the old concrete surface of I-5 and recycle it into a product called "crushed surfacing base course," or CSBC. This material was used to create the base layer placed under the surface layer of the new northbound I-5 roadway near SR 16. This layer is now covered in asphalt and crews are now pouring new cement concrete pavement on top of the asphalt. The cement concrete is the actual roadway that drivers will use this fall when the lanes re-open. Recycling the old concrete not only saves materials from heading to the landfill and reduces consumption of new materials, it also reduces the number of truck trips from the site by approximately 940 loads. By keeping trucks off the roads, are we reducing potential conflicts with motorists traveling through the work zone and reducing emissions and pollutants into the air. It's a win/win for everyone. concrete and recycling it as a base layer in the new roadway. Right: new asphalt on the new northbound I-5 alignment. The recycled base layer is under the asphalt. Do we encourage recycling on all of our projects? The Washington State Legislature created legislation in 2015 that requires us to develop and establish objectives and strategies to reuse and recycle construction aggregate and recycled concrete materials. While those efforts are now in place, even prior to the legislation we encouraged contractors to find ways to integrate recycled products into projects. This particular project was under way before the legislation passed so the contractor wasn't required to comply, but they also realized the environmental, cost-effective and green benefits to recycling and incorporated the practice voluntarily into the project. Environmental stewardship has been a part of our strategic plan for several years. We remain committed to promoting sustainable practices to reduce greenhouse gas emissions and protect natural habitat and water quality for years to come.